The Pattern 1914 Haversack was introduced with the Infantry Equipment, Pattern 1914 in List of Changes entry L. of C. 16977, dated 30 August 1914. 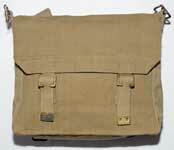 The face dimensions of the Haversack are the same as those of the Patt. '08 Haversacks, approximately 9-inches tall by 11-inches wide. Unlike Patt. 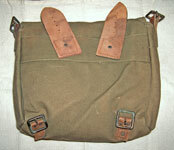 '08 Haversacks, though, Pattern 1914 ones are wedge shaped in profile, tapering from 4-inches deep at the bottom to only 2-inches deep at the top. 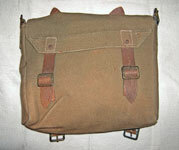 This is similar to the post-war Pattern 1919 and 1925 Haversacks. The chapes and tabs are leather instead of web and the buckles are tongued, unlike the Pattern 1908 tongueless Twigg buckles. 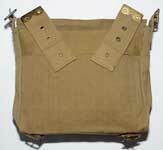 Additionally, the side chapes are 1-inch wire instead of 2-inches. This first issue Haversack is an excellent example of the type. 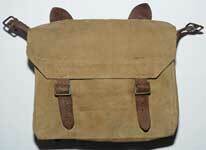 It is made of a light webbing and all tabs and chapes are London brown leather. It is maker marked "H.G.R. LTD." and dated 1915. From the Paul Hannon collection, © Paul Hannon 2011. An American made example of this first pattern, made by "Cook" and dated 1915, typically made using two piece steel rivets as opposed to the British hose rivets. The American web envelopes are also made of a finer, almost ‘officer’ quality weave, and often greener in colour. From the Chris Pollendine collection, © Chris Pollendine 2011. The second issue Haversack, like the second issue Pack, has grommeted web 2-inch tabs on the rear, the other fittings being leather. List of Changes entry L. of C. 17219, 31 December 1914 / 30 March 1915, does not specifically mention Haversacks, but refers only to Packs. Haversacks must be included, though, because KW can definitely confirm that they exist (although we don't have modern photos of one - Readers?). 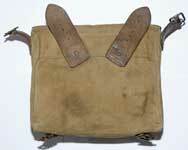 The third issue Pattern 1914 Haversack was introduced by List of Changes entry L. of C. 17599, 25 November 1915. In this version, all of the chapes and tabs are web instead of leather.This example is maker marked "John Smith & Co. London E" and dated 1915. 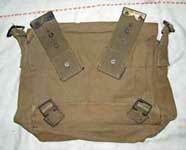 The buckles on the front flap straps are Patt. '08 style 1-inch tongueless Twigg buckles instead of the tongued type. From the Paul Hannon collection, © Paul Hannon 2011. Just as with the Pack, there are examples of "Pattern 1908 / Pattern 1914 “ Convertible haversacks to coin a collectors phrase, as they are widely considered to be a hybrid design to work with either. 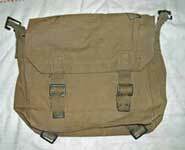 The Convertible haversacks are Patt. '14 in style, with the wedge shaped body and grommeted 2-inch web tabs on the rear, but with tongueless Twigg buckles on the all web chapes and straps. The side chapes are Patt. '08 style 2-inches wide. These are simply third issue haversacks that have been converted, presumably post war to Pattern '08 specification, probably to use up surplus stock. This example is typical. It is maker marked "Waring & Gillow" and dated 1918. From the Karkee Web Collection.